Terry Chan Photography: Movie Review: "Kung Fu Panda"
This is by far the funniest animation feature film since "The Incredibles", "Toy Story", and "Cars". 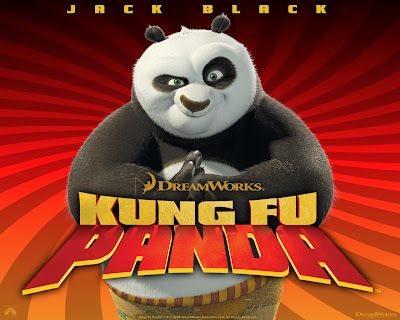 Jack Black was amazing as the adorable chubby Panda chosen to be the Dragon Warrior to battle against the evil Tai Lung. His epic journey from the day-dreaming kung fu master wannabe noodle shop seller to the hero of the movie albeit predictable. However, the characterization and the animated voice-over by the entire cast is just phenomenal. The dialog plus the comedic timing of Jack Black and Dustin Hoffman really kept me laughing in tears throughout the whole movie. Yeah, I know all you macho guys might be laughing at me for watching this movie... well I challenge you to go see this movie and walkout not laughing or think this movie is for kids only. As I recall, there were many men in the theatre with me and they laughed even louder than me! Now that's a feat in its own! So, don't miss it. It's a definitely a 2 thumbs up.